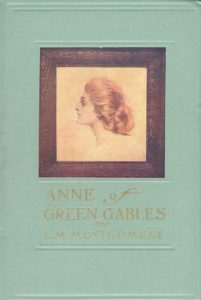 Lucy Maud Montgomery’s Anne of Green Gables, first published in 1908, has been considered a classic of children’s literature almost since its original date of publication. A novel which appeals to all ages, it has never dwindled in popularity. The story of an 11-year old girl who is mistakenly sent to a two older people for adoption, we watch as the ever optimistic and curious Anne grows into a strong, intelligent, and independent woman. The book has sold more than 50 million copies since its publication and has been translated into 36 languages. Montgomery did write sequels, but nothing has ever reached the level of success as her original novel. Her book has been adapted to the stage, film, radio, and television. Its popularity reaches around the globe. Montgomery was inspired by notes she had taken as a young girl regarding a couple who had mistakenly adopted an orphan girl after they believed they were adopting an orphan boy. Montgomery drew on her own experiences as a young girl in rural Prince Edward Island. The customs and peculiarities of what was then an isolated and rural part of the world gave rise the color and characteristics of the novel. Montgomery used a photograph of the famous actress Evelyn Nesbit, which she had clipped from a magazine and pasted to her wall, as the face from which she came to describe Anne. She sought a face which would fit her vision of youth and idealism. The novel shows us a young girl who is both naïve and brave. Unfailingly optimistic, Anne manages to transform her outsider status into advantages as she fearlessly takes on all challenges. It is her imagination and her intellect which guide her to mature and come to young adulthood as strong and independent woman. Through it all, she remains devoted to the elderly brother and sister who rescued her from a lonely life as an orphan.